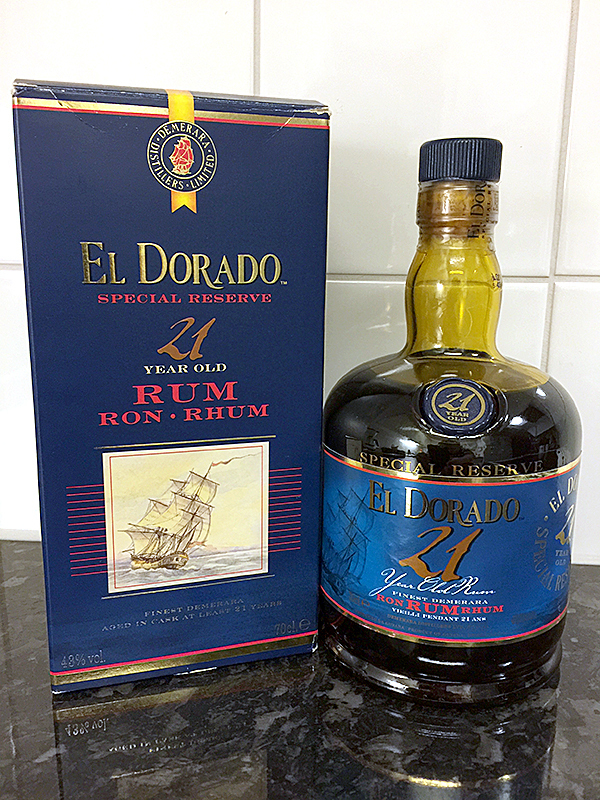 Have you found an online vendor selling El Dorado 21-Year? El Dorado 21 is produced near the equator in Guyana by Demerara distillery. The final product is a blend of rums, aged between 21 and 25 years and crafted using 100% locally sourced Demerara sugar. Traditional tools are used in the distilling processes including three unique wooden stills. The rums rest until maturity in 45 gallon oak casks. El Dorado 21 year is way too close to a good cognac than a flavorful aged dark rum, and it has a surprisingly strong after burn. Best memory is from the Demerara Distilleries between Georgetown and Cheddi Jagan Airport in Guyana when I visited their rum distillery and enjoyed their entire line up in its own surroundings. I've been lucky enough to be able to taste this rum during the Paris RumFest 2014. It was in my wishlist for a long time, so that I was really happy to be able to discover it, knowing that its small brother, 15 years old, is my absolute reference as far as aged rums are concerned. Hence my expectation was very high and I must admit that I was a bit disappointed ... Indeed this rum is excellent but it is much more acid than the 15 yo. So that the 15 yo will remain my absolute reference. I didn't think I'd come across a bottle of this considering how limited the selections in the regional liquor stores are. However one store had this behind the counter on the top shelf and I had enough cash on hand to get a bottle. After sitting unopened for a couple of months I decided to uncork it and have a sample. The aroma of this rum can be best described by the word "decadent". Definitely a vanilla aroma. The flavor is sweet with molasses, vanilla, caramel, and oak tones to it. Kind of spicy, too. A bit of a tongue-tingler as a result. It has a bit of a burn to it which fades rather rapidly. Definitely a sipping rum and one I recommend for special occasions. Like Saturday. "Personally speaking I cannot give any rum a 10 because I do not believe a perfect rum exists. The late great Vince Lombardi once said, "Gentlemen, we are going to relentlessly chase perfection, knowing full well we will not catch it, because nothing is perfect. But we are going to relentlessly chase it, because in the process we will catch excellence. I am not remotely interested in just being good."" This is another rum that comes awfully close to a 10. I definitely put it on the same level as Vizcaya VXOP and Plantation XO 20th Anniversary. My personal "Three Amigos" if you will. El Dorado 21 comes in the classical El Dorado bottle and the rum is delivered in a simple paper carton (picture). At this price I expect more from the presentation. In my opinion a lot of other rums in the same price range delivers better packings. At the first smell you get some sticky alcohol but when you let the rum rest in the glass for a while you smell fruit, flowers, oak and vanilla. In a way I find the smell fresh. In mouth you get some spice, oak and sweet flavours. Pretty strong but smoothe. There is a lot of things going on. The El Dorado 21 Year is smooth in the throat and has quite a long smoothe aftertaste with oak, spice and vanilla. This is of course a sipper that should rest in the glass before sipping it neat. It is a very great rum but El Dorado 15 Year is almost as good and costs about half the price. The El Dorado 21 has a nice oaky nose, with spice and a touch of honey. I really enjoy this rum, unless I drink it next to some of the other rums I've rated higher. I'm a bit of a sucker for sweet aged rums, and this one isn't as sweet as most of the others I've tried. Very good, but I think there are better at this price point. And I agree with others who said the El Dorado 15 is about equal to the 21 (at only half the price). I love the El Dorado 21 and and keep it stocked! This is one one of my favorite to enjoy my cigars with on the weekend. truly a fine rum, can't say enough great things about it. If I could afford it, I'd drink this more regularly. Allthough the price point probably makes me savor it more as a rare treat. I taste caramel, tobacco, toffee, light citrus, and bananas enveloped in a rich smooth sweetness. edited to add sugar test results-16-33g too much! I recently started with sipping rum to go with my cigar smoking. El Dorado 21 was recommended to me by a friend and it was a special order through the Pennsylvania Liquor Control website. I am a somewhat novice but it was so smooth and I thought it had a black cherry flavor. I was so impressed with this rum that I immediately ordered the only remaining bottle in PA. In short this is bloody good. I find it to be the most "exotic" tasting of the entire El Dorado lineup. The taste profile of the other ED's has more similarities, even including the ED 25. The nose of ED 21 is dark, full and rounded with notes of oak. leather, liqourice and ripe fruits. The rounded, dark and full bodied palette offers a classic mineralised demerara character with notes of leather, liqourice, barrel, ripe banana and slightly underplayed, yet deep caramel sweetness. It's a real treat. This rum makes me think of a mellow version of the overproof and fantasticly explosive velier bottles from the same region, like Albion 1994 or port mourant 1997. In comparison this rum offers tremendous taste but wont knock your socks off either. Great. El Dorado rums are classics, but the 21 years is distinguished by an exceptional taste that elevates the standards of rum to the best I've had the chance to taste. Unlike other rums, it is assembled with a minimum of 21 years old rums and not, as usual, containing at least the oldest at 21 years old (solera). From Guyana, it is aged in oak barrels and distilled in over 200 years old wooden stills. Knowing these technical details it is easier to understand the wealth behind this rum. Just the bronze color and even with the slowly running legs on the glass, we can guess the aging of more than two decades. Iin the mouth it is dry with oak aromas, spices (vanilla, cinnamon) and brown sugar. A small smoked aroma packs all, in a almost perfect harmony. In the final, vanilla dominates, but a little chocolate taste is also present. From beginning to end there is no burn, no tingling, just a balance flavor that gives this rum superb qualities. Enjoy it alone, without ice, without accompaniment. The 12 and the 15 years old are quite special rum, but with the 21, El Dorado is distinguished from others. Les rhums El Dorado sont des classiques, mais le 21 ans se démarque par un gout exceptionnel qui élève les standards du rhum jusqu’aux meilleurs que j’ai eu la chance de gouter. Contrairement aux autres rhums, celui-ci est assemblé avec des rhums de minimum 21 ans et non, comme à l’habitude, contenant au plus vieux un rhum 21 ans (solera). De la Guyane, Il est vieilli dans des fûts de chêne et distillé dans des alambics de bois de plus de 200 ans. Il est plus facile en sachant ces détails techniques de comprendre la richesse derrière ce rhum. Juste à la couleur bronze et même à la lenteur que les jambes descendent sur le verre, on en devine le vieillissement de plus de deux décennies. Il est gras dans le verre, mais en bouche il est sec avec des arômes de chêne, d’épices (vanille, cannelle) et de sucre brun. Un petit côté fumé emballe le tout dans une harmonie presque parfaite. En finale, la vanille domine, mais un petit gout chocolaté est aussi présent. Du début à la fin il n’y a pas de brulure ni de picotement, juste un équilibre entre les arômes qui donne à ce rhum des qualités superbes. Il se déguste seul, sans glaces, sans accompagnement. Déjà le 12 et le 15 sont assez spécial comme rhum, mais avec le 21, El Dorado se distingue des autres. I won't give it a 10, but I find myself going back to this bottle again and again. It's sublime the way the flavors are presented when sipping on this. I'm just starting the bottle so I may adjust my score up or down a star by the time I finish it, but it's certainly on my keep a bottle in the bar list now. I tasted this rum 3 times and I still could not identify the aromas and flavors of this rum. My notebook was more like a literary and dramatic trial. But it's done. We start our last tasting (actually fourth) with this 21 year. Really more complex than 15 years with almond and walnut notes. fruit notes on the palate (banana), but also chocolate, coffee, expresso. very long finish. It was a real pleasure to finally taste this rum in optimal conditions. For what this rum costs (2 to 4x more than others), you are better suited to buy mire bottles if another type. El Dorado 12 is the best that they make, and they quickly go down hill with age, which is perplexing. If you prefer harsh, this is for you. Heavy, sweet, smooth... Rich and savory. Superb sipping rum. Aroma: citrus fruit, tabak, banaan, karamel en hout. Smaak: droog fruit, gebakken banaan, karamel, hout, vanille en melasse. Nasmaak: heel lang en zoetig, karamel, melasse. De ED 21 heeft een complex aroma en smaak die blijft veranderen naar mate je je glas drinkt. 16-33 gr/liter suiker toegevoegd. Jammer, niet nodig, 1 punt minder. A truly great rum. So many things in it's aromas. I like the "thickness " in it. It is smooth, yet warm, it is dark in color it tastes fruity to me. It is expensive but you have to get a bottle once. So much flavour!! Long lingering finish, super smooth and very complex it's close to being my favourite rum!! Lets be very clear about the difference between aging rum vs whisky; Whisky is aged in very cool conditions creating a slow process with vary little evaporation and maturity comes very slowly. It cannot be aged too long in my opinion. Rum ages in very different conditions being very warm with a tremendous amount of evaporation further concentrating the flavours into the remaining fluid. Aging rum creates high loss for the distiller driving the cost even higher but I feel it is possible to age rum too long. Another aspect of rum is that there is no industry standard for the age designation; a 7 year rum may have aged fully fledged in a cask; be blended with other rums; be Solera aged in a pour through method; or be cooked up in a back room over donkey poo... 'they' really need to standardize it for the good of the industry (whoever 'they' are). I suggest to not read anything into age statements and judge the rum "as is" but you will likely pay according to the age. That being said, this is a fantastic aged rum and I guess it is largely made up of rums aged for 21 years in a dark cool Guyana warehouse; perhaps blended by the master to achieve the balance he is after. Fair enough! The dark complexities make it worth the price which ran ~CAD$90. As their premier product the bottle could carry a bit more elegance over the other El Dorados so that brought it down a notch to a 8. Un des meilleurs de ma collection. One the best, must have. Superb, I like this rum the best of the the 12, 15 and 21. The thing that puts it in front of the 12 and 15 is the smoky finish and slightly drier body. I love cigars and this rum with a nice cigar is a match made in heaven. A very smooth and very well made rum. The only downside is the price. Found on sale for $71. bottled in 2015. It takes a while sipping to tease out the complexity. Traces of fig, honey, dark sugar (without being to sweet), spice, orange. Velvet in the mouth with a rich and long lasting finish. Not sure I would have forked over $100+ when first stared tasting, but after 30 minutes tasting and feeling the aromas and tastes it has grown on me. I was disappointed by this one. A smooth whiskey would have done the same trick for me. The dry taste of bourbon barrels caught me off guard. Not what I expected after the good 12 year old and wonderful 15 year old. Harsh smokey rum, a bit like an single malt whiskey. Round, big bodied liquid for the advanced rumdrinkers with a big wallet. I don't want my rums to taste like whiskey. If I want whiskey I drink whiskey. Hope that the 12 yo is my cup of tea instead. A rich dark Demerara rum delivers an unexpectedly dry initial impression, despite the added sugars. Add an ice cube to bring out additional layer of flavors that elevate this rum. It would rate higher if not for the price point and additives. Aging a rum for 21 years is costly, but there are other other rums at lower price points that are equally as tasty.